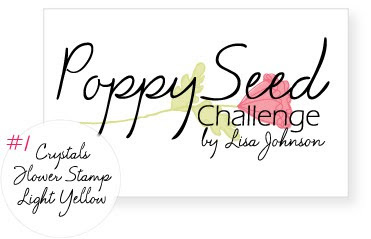 It's always fun to find a new creative challenge...and this week, I found TWO of them...the Poppy Seed Challenge at Lisa Johnson's Poppy Paperie blog and the Free For All Challenge. 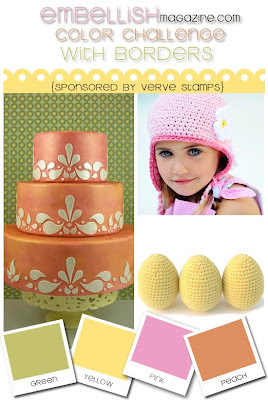 I combined these two new challenges, Poppy Seed Challenge #1 which requires crystals, flower stamp, and light yellow...and Free For All #1 at Splitcoaststampers to use texture, one color that you rarely use, and patterned paper. The Embellish Color Challenge with Borders was also a MUST for this lively card, using the colors green, yellow, pink & peach. How cute are the little crystals? They are from the new Eggcelent Eggs Kit in the Occasions Mini Catalog...and I'm thinking that I heard these crystals will be offered again...YAY! If you're in the mood for a new challenge, go check these out...you're sure to find some inspiration! Check back here tomorrow for a new Curtain Call Color Challenge...and a BIG ANNOUNCEMENT that you won't want to miss! Love it! Great job on the challenges. Great colors! It is such a springy card. This is GORGEOUS!!! Love the pink and yellow colour combo and the crystals add the perfect sparkle! Your card is lovely! I like how you colored and embellished the main flower image. Very nice! Stacey, this is so sweet! I love your flower! Thanks so much for playing along with us at Embellish! What a gorgeous ribbon and flower!!! So glad you joined in on the Embellish challenge! 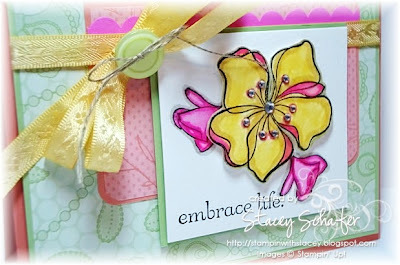 Beautiful card, Stacey! Thanks for playing along with us!